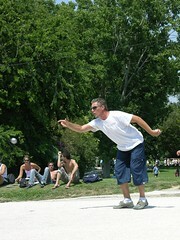 I BEGAN PLAYING Pétanque in the Marseille region, in 1998, after having watched the sport obsessively for more than 15 years. I played American sports, especially basketball, and rugby. As my basketball career waned, I began playing boules for fun, helped by a group of older players in Cassis who were willing to help a younger novice. I still return to Cassis to play “friendly games” (not for money) with these friends from time to time. In 1999, I started competing in, and losing, tournaments. In France, tournaments are almost always single elimination, that is, if you lose one game, you’re out. Gradually, I began to win a few games in the early stages of tournaments, but found myself losing to the same players. One of these, Morade Bouyahiaoui, several times a champion of the department of the Bouches du Rhone (where Marseille is situated), noticed that I was not French, a fact that intrigued him. We gradually struck up a friendship, and he eventually asked me to play with him. 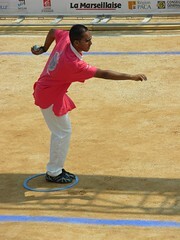 I won my first tournament in 2000, pointing for Morade and his partner, Kader Benefissa. 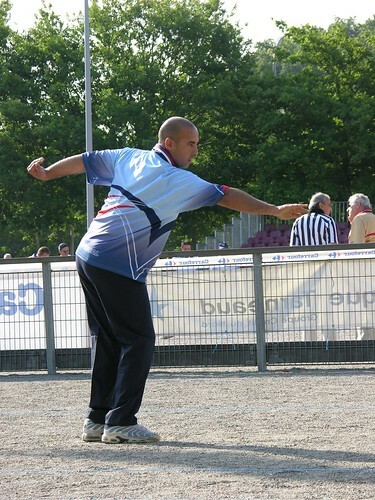 In the final, we defeated a team led by the great shooter, Bruno Castellane. Morade and Kader were Doubles Champions of the Bouches du Rhone (the Department in which Marseille, Aix-en-Provence, Arles, Beaudinard, and La Citotat are situated) in 2002. Thereafter, I played tournaments regularly with Morade. During one stretch (July 2003), we won 4 official doubles tournaments in 5 days, never giving up more than 3 points. I also began playing with Kader, who won the Marseillaise in 2006. In 2004, Kader and I lost a final at the greatest boules club in France, la Boule Florian, against the world champion, Henri Lacroix, 13-9. I remember that I did not play well, that Kader played perfectly, making carreau after carreau, and that there were about 300 people watching us. The first few rounds of that game constituted one of the scarier moments of my life. Lacroix was gracious in victory and we drank pastis together; he has been unpleasant ever since (such is competitive Pétanque). These days, I play with Morade, Kader, and our mutual friend, Marco Gouast, who was Singles champion of the Bouches du Rhone in 2004. I rarely play competitively in the U.S. I have competed in only one U.S. championship, the 2002 Singles Championship (which I won). I have played in the U.S. World Championship Qualification Tournament (WCQT) every year since 1999. The U.S. chooses its World Championship team through this competition: the winning triples team represents America, supplemented by a fourth player. Through 2006, I have played in eight WCQTs, losing in the final five times - in 1999 (shooter), 2001 (middle), 2004 (pointer), 2005 (middle), and July 2006 (pointer). I have been selected as the fourth player three times, for the World Championships in 2003 (Geneva), 2005 (Brussels), and 2006 (Grenoble). In November 2006, I finally won the WCQT, playing middle, with my partners Nghia Ngo and Xavier Thibaud. In 2007, we will represent the USA in Pattaya, Thailand. My best result in the Marseillaise was in 2006, when I made it to the sixth game (I was the last foreign licensed player to lose), or the round of 128, 4,112 triples teams starting. My best showing at Millau was also in 2006: I lost in the 1/32 finals — the round of 64 — in doubles, 1,447 teams starting. I also travel regularly to play Pétanque, to Madagascar, Spain, and Thailand, all world powers. This article is a reformatted version of the original one posted by Alec on his own web page.